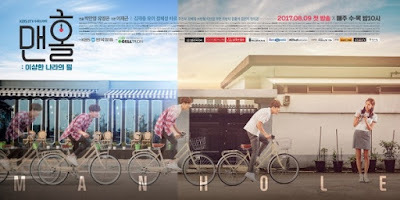 Manhole (Hangul: 맨홀: 이상한 나라의 필; RR: Maenhol: Isanghan Naraeui Pil; lit. Manhole: Wonderland’s Feel) is a South Korean television series starring Kim Jae-joong, Uee, Baro, Jung Hye-sung. The series airs two consecutive episodes on KBS2 every Wednesday and Thursday at 22:00 (KST). Plot: Bong-Pil (Kim Jae-Joong) has been preparing for his civil servant exam for the past 3 years, but he is not enthusiastic about his studies. He becomes disappointed that his lifelong friend Soo-Jin (Uee) will soon get married. He has loved her in vain for the past 28 years. Bong-Pil then falls into a manhole and travels through time. He struggles to prevent Soo-Jin’s imminent wedding.